The Star Wars franchise keeps rolling along next month with the highly-anticipated Star Wars: The Last Jedi, and while the next few years of the franchise are certainly intact, with Solo: A Star Wars Story (May 25, 2018) and Star Wars 9 (December 20, 2019), beyond that remains a mystery. Disney CEO Bob Iger revealed in March that the studio has Star Wars movies planned until 2030, and while the CEO didn't reveal any specifics, Kathleen Kennedy reiterated those comments in a new interview on The Star Wars Show. Here's what she had to say. "We're sitting down now, we're talking about the next ten years of Star Wars stories and we're looking at narratively where that might go; future stories beyond Episode 9, with these new characters, Rey, Poe, Finn, BB-8, but we're also looking at working with people that are interested in coming into the Star Wars world and taking us to places that we haven't been yet, and that's exciting too because it's a vast galaxy far, far away... The possibilities are endless." There was another report from March that claimed after the Skywalker saga wraps up with Episode 9, there will continue to be new Star Wars movies every year, but there will be a long break before a fourth Skywalker trilogy saga will happen. 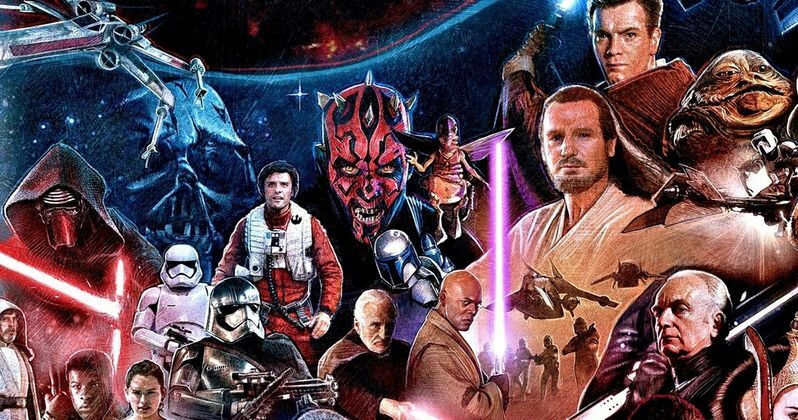 While that report was never confirmed, it falls in line with another report that claimed all future Star Wars movies after Episode 9 will be spin-offs. What's interesting is that Kathleen Kennedy specifically mentions Rey, Poe Dameron and Finn, the three primary new characters in this trilogy, and there has been speculation for quite some time that Rey is in fact the daughter of Luke Skywalker. Still, none of this has been confirmed at this time, but there have been reports of some potential spin-offs that are in the works. A report from August revealed that Disney and LucasFilm are reportedly developing Boba Fett and Yoda spin-off movies, with another report claiming that Yoda will be coming first. It was widely reported that Boba Fett was the spin-off that director Josh Trank was working on before he was unceremoniously fired from the project. There has also been plenty of talk of an Obi-Wan Kenobi spin-off as well, but until LucasFilm announces their post-Star Wars 9 slate, it's all speculation. Han Solo recently wrapped production, with J.J. Abrams directing Star Wars 9, coming back to the franchise as a director after Colin Trevorrow was ousted from the franchise after spending quite some time developing the script. There has been some controversy swirling around the firing of Han Solo directors Phil Lord and Chris Miller, along with the sudden dismissal of Colin Trevorrow, but that hasn't taken away any anticipation for these projects. While we wait for more on the Star Wars universe, take a look at the latest episode of The Star Wars Show below, with the Kathleen Kennedy interview starting at the 2:05 mark, courtesy of Star Wars YouTube.